The exact date of commencement of the examinations and detailed time table will be notified later. The examination application forms of students are to be submitted online through college login. Also, hard copy of the same may be downloaded and submitted to the examination branch duly signed by the student and the Principal concerned along with photocopy of qualifying examination. The examination fee once paid by the candidate/college will not be refunded or adjusted. be submitted separately along with separate Nominal Roll. (b) Inform the students that the examination fee & application forms will not be accepted after the due date. (c) Instruct the students to enclose the photo copies (Xerox copies) of the memorandum marks of qualifying examination to verify the eligibility. (d) Note that the Hall Ticket No allotted to a candidate at the time of admission shall not be changed or allotted to another candidate, even if the first candidate has cancelled his/her admission. 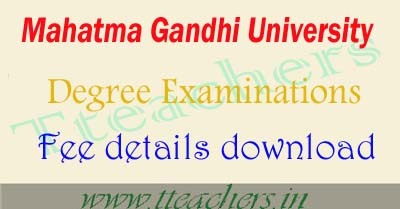 (i) Nominal Rolls: II&III year students admitted in Mahatma Gandhi University One hard copy of nominal rolls (consolidated list of candidates) generated using the Students online information system after due verification by the Principal and Nominal Roll signed by the Director, Directorate of Academic Audit, MGU. (ii) Subject-wise Data of registered candidates in the prescribed proforma, which must match with that of the forms are submitted. (iii) No Dues Certificate issued by the Academic Branch , MGU. (iv) Clearance Certificate from the Director, Director of Academic Audit, MGU. (v) Fees Abstract (in duplicate) the first copy to be submitted to the Examination Branch, MGU and the second copy of the concerned Sections. 6. Application forms with all the above requirements should reach the Examination Branch, MGU, on or before 07.01.2017.